Before I began my DUCK expedition to Romania last summer, I watched a number of documentaries and read numerous articles that aimed to portray the plight of Romanian children in state care. These programmes and articles painted the image of social excluded children who were malnourished, mistreated and hidden away from the rest of society. Heart-wrenching images of hollow eyed children confined to cots and unable to walk or talk by the age of five which demonstrated the true devastation of institutionalisation. Romania’s orphanage crisis is considered to be the product of Nicolae Ceausescu’s communist regime; film maker Florian Lepan stated in an article for the BBC that “the seeds of the problem were sown in 1967, with Ceausescu’s prohibition of birth control.” Ceausescu’s desire to increase Romania’s population not only resulted in dangerous back street abortions but a vast number of families living in absolute poverty. Families who were unable to feed or clothe their children often resorted to handing them over to state care. Thus, the majority of children considered to be Romanian orphans are often not actually orphans by definition. The conditions and treatment of children living in over-crowded state institutions were revealed to the world after the fall of Ceausescu’s regime in 1990 and sparked a huge media interest. As a result, the image of the withdrawn, mistreated and isolated child is the dominant image in many people’s minds when they hear the words ‘Romanian orphan’. I prepared myself to witness abuse, social isolation and horrendous living condition for children in state care in Romania, yet this dominant image is quite far from what I witnessed. The NSPCC (2012) claim that there are five basic needs humans have from birth these are: food, shelter, safety, protection and emotional simulation. Unlike in the 1990’s and early 2000’s, the children in the Harghita region seemed to have access to these basic needs. The children were all given 3 meals a day and additional snacks, which, although basic, were nutritious and plentiful. The living conditions for many of the children we worked with represented the initial steps towards de-institutionalisation and demonstrated great improvement from the institutions of the past. The majority of children lived in apartments amongst their peers, cared for by consistent carers who many of the children shared positive relationships and secure attachments with. Additionally, the children showed no sign of feeling unsafe in their environments; they appeared to be protected by social services. The most promising form of protection the children had, in my opinion, was protection from social isolation. 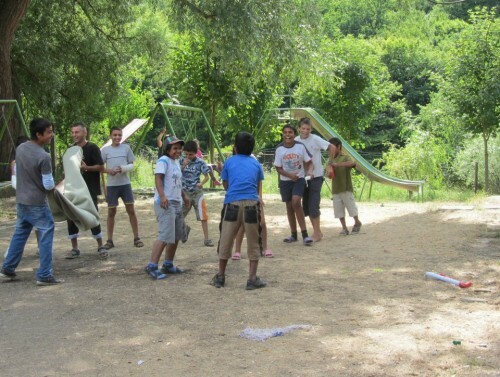 The children had friends in the local community, the younger children played in the local park and the older children were granted the freedom to go to meet friends in the town and several even had part-time jobs in the local area. In addition to a basic level of emotional simulation the children certainly had intellectual simulation; they all attended the local schools and were very keen to show us their progress in were achieving in academic work. The children’s access to basic needs was unexpected but a positive discovery that demonstrates progression within the Romanian social service. Witnessing the experiences of children in state care in Romania encouraged me to consider how their experiences compare to the relative plight of looked after children in the UK. There is increasing government focus on raising the achievements of looked after children in the UK, due to the large body of evidence to suggest that looked after children have the worst life outcomes of any other social group. Life outcomes in the UK are intrinsically linked to educational achievement; the Joseph Rowntree Foundation (2007) suggested that children in state care in the UK are often denied the additional support they need to close the attainment gap. Although the majority of looked after children in the UK have access to the basic needs discussed above, it has been argued by Rich (2009) that children in state care are often given “Labels that Disable” and as a consequence they are restricted from fulfilling their potential. I feel that as the system improves in Romania, children in state care are less subject to these labels than looked after children in the UK, thus finding themselves more socially included in their society. The stark contrast in lifestyle across the majority of Romania to the UK must be remembered, and I am not suggesting that Romanian orphans have more physical wealth to looked after children in the UK. I am suggesting, however, that the need for material possessions and the desire to place everyone in a category, which is dominant in UK culture, causes the most vulnerable groups to be labelled and thus become socially excluded. Overall, there is still much to be done to improve the lives of children in state care in Romania; not all children in state care have a positive experience and there is no such thing as a quick fix to deep rooted institutionalisation. However, I did not leave Romania feeling guilty or distressed about the lives and prospects of the children I met. I actually felt hopeful and happy that they had people who cared for them, food, shelter, possessions, an education, aspirations and a smile. We must remember that there is hope amongst the distress and sadness exposed to us by the media on a daily basis.